Once again the Isle of Man Ambulance & Paramedic Service is gearing up for TT. Planning commences early in the year for the TT and for the Manx Grand Prix shortly after the TT finishes. Considerations for the day to day management of TT our busiest time of the year take into account available resources, and using them dynamically; to best provide not only emergency but routine responses to patients requiring treatment and transportation. Leave for ambulance staff is very minimal during it's busiest time and like most of the other emergency services is a case of all hands to the wheel so to speak, including the Chief Ambulance Officer himself a Paramedic. 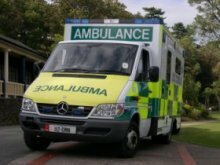 During 2008 the IOM Ambulance & Paramedic Service responded to over 6 500 emergency calls for assistance and 1 500 calls for urgent cases. The service in line with most other UK Ambulance Trusts is seeing a rise in call demand of 7 - 10% annually. This year the department will again be employing the use of an air ambulance to assist with the demand for emergency work and transfers of the general public. 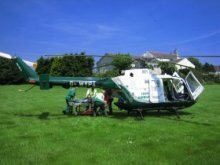 This air ambulance is staffed with the medical team from the IOM Ambulance Service offering Paramedical skills and evaluation, and complements the two Airmed Air Ambulances provided for competitors in the TT races. With such a huge influx of visitors and machines to the island for the TT, we are bound to encounter a few problems on the roads. Always our team of Paramedics, Ambulance Technicians, carers and control staff want to provide the public with the same excellent service we have provided in previous years. When dealing with incidents we aim to ensure that the correct level of response is sent to each, because of this it is essential that we acquire accurate information from the callers where possible. To help us to help you, we ask callers to give us the following information where possible. 1 What is the Exact Location of the Incident ? 2 What is involved in the Incident ? (i.e a bike, pedestrian etc) ? 3 How many casualties are involved ? 4 If a road traffic collision, is there anyone trapped in a vehicle ? 5 Are the casualties conscious and breathing ? 6 Are there any other dangers? (i.e. fuel, power lines etc) ? We realise that the above information will not always be available due to the caller possibly being some distance away from the incident and casualties; when possible, the information provided does help us to help you. We remind people to think of the dangers and not become a casualty themselves. As a closing note from us all at the Isle of Man Ambulance & Paramedic Service, please drive safely, wear the appropriate clothing and remember alcohol/drugs and driving do not mix! We hope you do not have to call on us and enjoy a great TT.